She is one of my Horsman dollhouse dolls, Nancy. I am not going to rename her. So, she is maid Nancy in the Erlenhof. 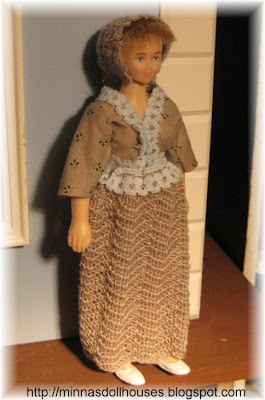 I sewed Nancy a blouse and I crocheted a skirt and a bonnet. Tämä on yksi Horsman-nukkekotinukeistani, Nancy. en aio ristiä häntä uudelleen. Hän on siis Erlenhofin sisäkkö Nancy. Ompelin Nancylle puseron ja virkkasin hameen ja hilkan. Nancy is beautiful- you are so very talented with the crochet! She's very pretty. The name fits her perfectly! Your crochet is some of the best i've seen. And yes, the name fits her very well. She is beautiful and looks like a Samurai Warrior. All she needs now is her sword, shield, and horse. She is a true treasure....and I LOVE that room! !